Ironing can be a tedious task that many of us dread having to do. While we can’t get rid of it completely, there are definitely products that can make this task incredibly easier. However, trying to find these products on your own can be a chore in and of itself. Lucky for you, though, we’ve done all the searching so you don’t have to. We have found that the best bet for speeding up your ironing is to employ steam generator irons. 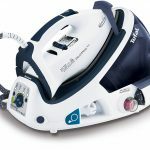 In this article, you’ll find plenty of tips and suggestions to find the best and most reliable steam generator irons to speed your housework along. 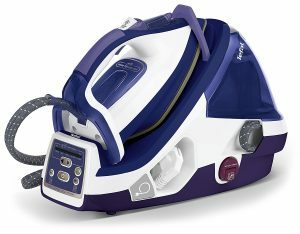 The first product that we have on our list is the Tefal Gv8461 Pro Express Autoclean Steam Generator. 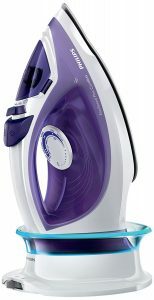 This steam generator iron produces plenty of steam for you to get your ironing done quickly without much fuss. The steam output is due to 6 bar pressure as well as an extra 260 grams per minute of Turbo steam for your particularly difficult ironing jobs. The Tefal Steam Generator is also a long-lasting piece of technology with an anti-scale collector to prevent mineral deposits over time which is especially helpful if you have to work with hard water. There is also an Autoclean soleplate to save you the time of cleaning your iron before doing your ironing. The soleplate of this iron also features an anti-drip system as well as being scratch resistant. There is also an Eco setting to save power if you would prefer. Turning this setting on will save 20% of the energy that is normally used without damaging the performance of the iron. The system will also turn off automatically if left on, taking out forgetfulness as a hazard. Once you’re done with it, this product is easy to store as well since it features a handy lock system as well as auto-rewind compartments for the electrical cord. This wouldn’t be a proper review without looking at the good and the bad of the product though. While customers readily say that this iron is easy to use on any material as well as reliable, they also complain that the tank can be difficult to fill and it does take a couple of minutes to heat up, specifically 3 to 5 minutes. However, none of these negative features are serious enough to warrant not suggesting this product. 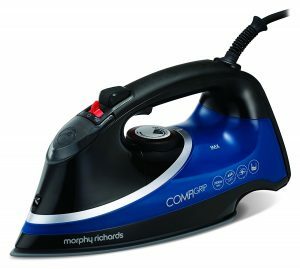 This next product is the Morphy Richards 333020 Jet Steam Generator. The steam output on this steam generator iron sits at 100 grams of high level steam output, which will help you fly through your chores. In this iron, the steam is derived from a rather large detachable water tank that holds one liter at a time. With a tank this large, you won’t have to take breaks to refill your iron in the midst of your work. There is also a water spray option to help you handle tough fabrics and creases without excessive work on your part. Durability is also a main concern for this company, so they created for you an iron that will last a long time. This is done with a number of different features. The stainless steel soleplate is made to last a long time as well as create the best surface possible to remove wrinkles and creases from your clothes. There is also an anti-scale cartridge so your iron doesn’t suffer from harmful mineral buildup. If the cartridge wears out or shows fault, this one is even replaceable, so you can continue to protect your iron throughout its entire lifetime. The company also boasts a comfortable handle and quick heat up, so your chores don’t last longer than they need to and are as easy as possible. People who have bought this particular steam generator iron have left nothing but hopeful reviews for future buyers. The reviews lack any cons, which is a rare miracle to find a product with this level of good reviews completely without any warnings of negative traits you’ll have to deal with while you use it. 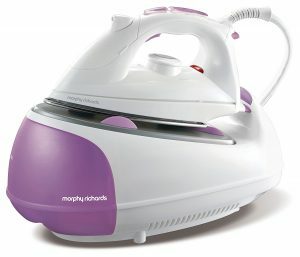 This Morphy Richards steam generator iron has a powerful performance with 2800 watts working behind it. The 400-milliliter water tank is less than half of what the tank was for the previous product, but it is still enough that there won’t be any problems that will cause you to have to constantly refill the tank. If you’re worried about the tank though, the iron makes up for it in durability and ease of use. This iron is made with tri-zone technology, which is a technology that is also used in many high-end hair straighteners. With this in use, you will find that you’ll be able to effectively iron many different types of clothes quickly. Also, the use of an ionic soleplate rather than a traditional stainless steel soleplate gives your clothes a silky finish so they look and feel their best. There are also features in play to ensure your iron lasts as long as possible such as a lime scale management system, which cuts down on the maintenance you need to do yourself as well as effectively protect against the damage of repetitive use of the iron. Unfortunately, there are some drawbacks that customers have complained about for this product. The first is of course, that the tank is smaller than some similar models, so it doesn’t hold as much water at once in it. This iron also doesn’t have the automatic power off function that some do for safety purposes. 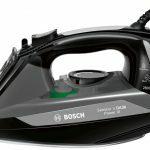 All in all, though, this iron has many great characteristics that make up for its minor faults such as having multiple settings, heating up quickly, as well as all of the features we mentioned above. Even with a couple feature oriented faults like this, the 303107 is still a very reliable iron. The Bosch Power III Steam Iron boasts a fast heat up time with a powerful 2800 watts behind it. It offers continuous steam at 40 grams per minute as well as a steam shot of 170 grams per minute for your more stubborn garments. 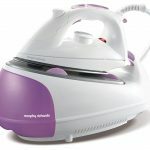 It also features a multi-directional Ceranium Glissee soleplate which will help you ironing in all directions quickly, without leaving unwanted creases. It also features an ergonomic handle, so you won’t suffer no matter how large of a pile of laundry you have to iron. 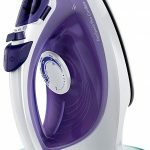 The tank on this iron is somewhat smaller than others on this list with a 320-milliliter capacity, but also offers anti-drip technology to make your job easier. This iron also comes with a two-year guarantee that it will work as well as many characteristics built in to make sure it lasts you a long time. It also has a triple cleaning function with self-clean, calc’n clean, and an integrated anti-calc system to protect from mineral buildup wearing your iron out prematurely. This model also features a cord that is 3 meters (almost 10 feet) long, so it will reach wherever you may need it to. This steam generator iron has many good reviews to back it up, such as an excellent distribution of weight for an easy and even iron. To be fair though, there are a couple of minor complaints that have been addressed. For one, the cord is very long, but lacks a compartment to store it when not in use, so it is easy to tangle. There is also the complaint that the anti-drip feature doesn’t always work exactly as it should. Overall, though, even with its flaws, this product is highly recommended by consumers who have tried it. 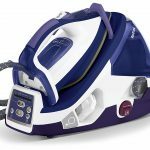 The Philips GC2086/30 EasySpeed iron offers 35 grams per minute of continuous steam and an option for a 150-gram steam boost for those particularly deep and stubborn creases. This steam generator iron also has a quick charge starting base powered with 2400 watts. Against other models, quick takes on a new meaning with this iron, it heats and is ready to go in just six seconds. The iron also features light feedback, so you can see the status of your iron at any time- whether it is heated, on, off, etc. 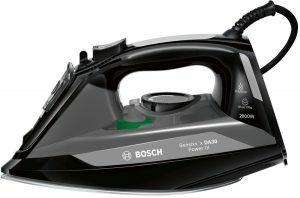 The ceramic soleplate on this iron is perfect for ironing all types of fabrics as well as it is durable and scratch resistant. As well as reliable, this iron is space saving. It lacks a cord, which means not only do you have the freedom of not having to keep it plugged in, but this allows it to take up less space than most irons. In place of a cord, this iron comes with a charging base, making it easy to charge while storing. The sleek design also helps with storage and ease of use, since you won’t have the same problems that a bulkier model would bring along. The reviews on this product are mixed to say the least. While this iron does its job, and is effective, the charge doesn’t last long. Unfortunately, while this is a fantastic iron for small jobs, as far as larger projects go it leaves some room for improvement. 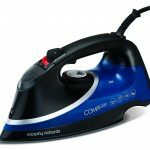 The cordless option does boast some positive reviews though, mostly in the fact that it is easy to store the iron as well as iron without having to concern yourself with working around or worrying about a cord getting tangled. 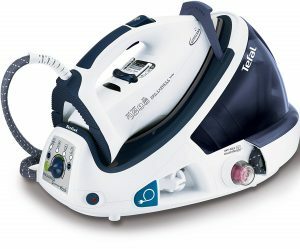 The Tefal GV8976 Pro Express Total employs 6.5 bars of pressure and 450 grams per minute of steam. It also features 5 pre-set settings of wool, silk, cotton, linen, and synthetic fabrics. 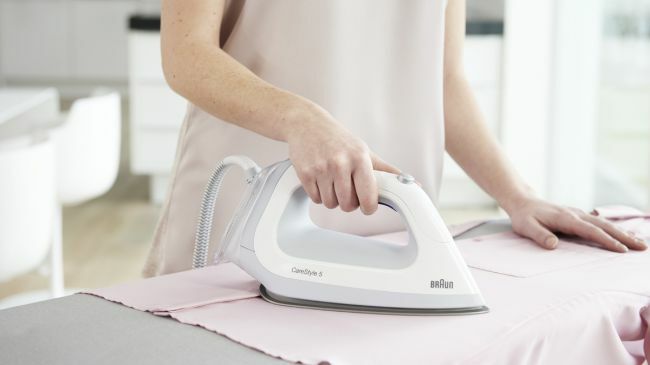 In addition, this iron also features smart technology that will adjust its heat and steam settings so that your job is easier by making clothes less of a hurdle to iron. Much like other trustworthy irons, the company has put in several safeguards to make sure that the product you buy will last you a very long time. To give you a long-lasting soleplate, they have installed Tefal’s Glide Protect auto-clean soleplate. This provides not only a smooth, scratch resistant surface, but will protect against any fabric strands that attempt to attach themselves to the soleplate. The second safeguard is an anti-calc lime scale collector. As we reviewed on the previous products, this will help protect the iron from mineral buildup over time. As with any product, once you get past the advertisements this product has its pros and cons. Consumer reviews report this product as rather exceptional, but with some design features that are less than convenient. The biggest complaint is that the iron is slightly bulky. While this doesn’t affect performance or reliability, it can hinder you in storage and make ironing itself a little more difficult than a smaller, sleeker model might. However, overall, this product is highly recommended and the features of this model work fantastically.